Nifty ended the week with a flourish with a gain of 53.80 points, but it could have been better, with profit booking taking the sheen out of the up-move during the dying minutes of trade. The index closed at 5703.30 the highest close in 17 months and on a week on week basis Nifty closed flat with a gain of just 12.15 points. The Option Table saw highest addition at 5700PE to the tune of 11 lacs and 6000CE saw addition of 7.5 lacs. Call option 5900-6200 added 16.12 lacs huge amount of OI, with huge liquidation seen at 5800 and lower levels. Put Option 5900-5300 added 46.02 lacs huge amount of OI. Highest accumulation on Call option 6000 at 45.9 lacs & 5800 at 42.3 lacs whereas Put option 5300 at 55.1 lac & 5400 at 47.6 lacs. 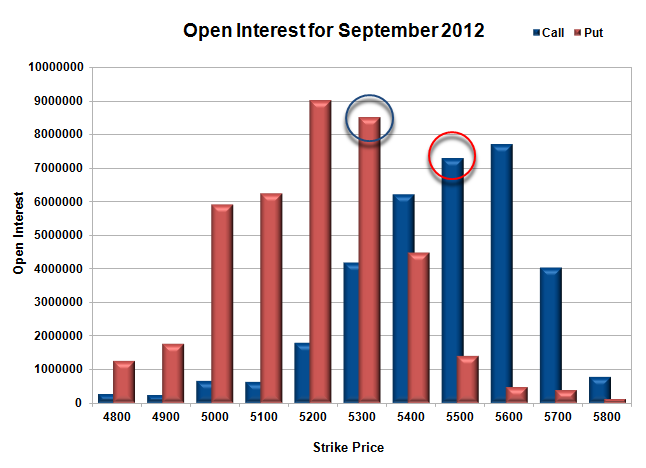 Nifty Open Interest is at 2,36,72,400 up by 18,44,000 with huge increase in price, most probably huge long build-up. 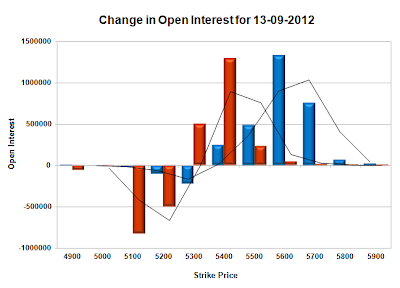 Bank Nifty Open Interest is at 13,11,300 up by 45,575 with small increase in price, most probably long build-up. FII’s bought huge 20.01 lacs of Futures, most probably long build-up as their Net OI also increased by 26.85 lacs, and their average price per contract comes to around 5554. FII’s future open contract as on date is 5.13 lacs. 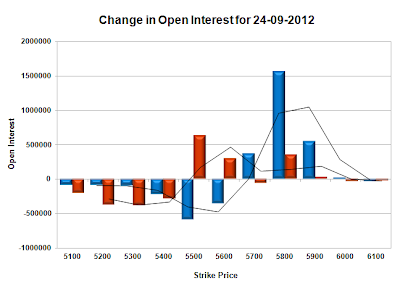 PCR Open Interest (Volume) jumped quite a bit to 1.250 on the first day of the series. Support developing at 5700 with huge addition for the day at 11.1 lacs and below that at 5300 with OI of above 55.1 lacs. 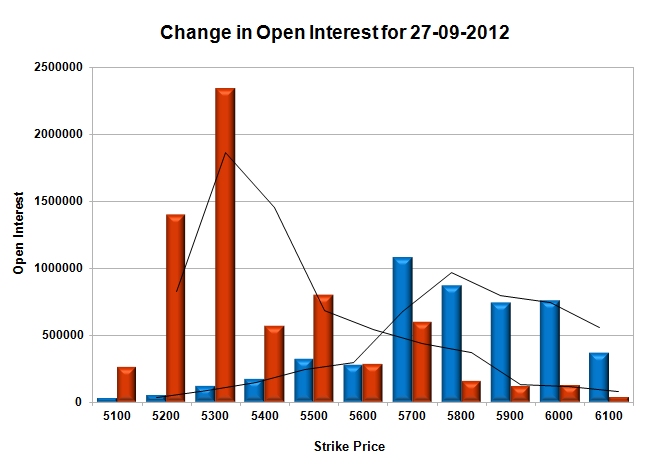 Resistance at 5800 with huge OI of 42.3 lacs and above that at 6000 with huge OI of 45.9 lacs. 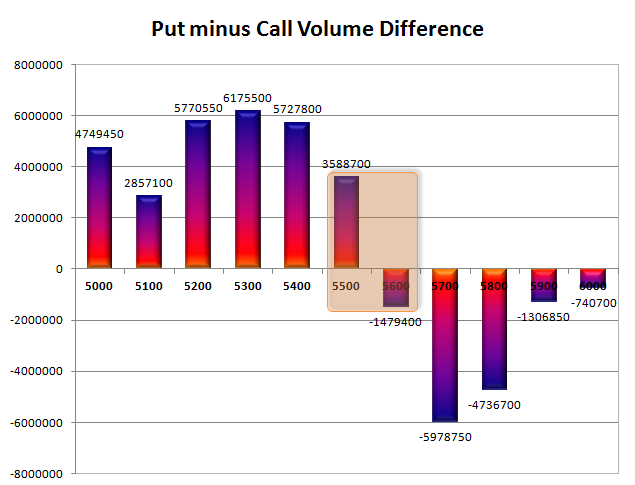 Range as per Option Table is 5658 -5754 and as per VIX is 5665 - 5752 with 5690 as the Pivot. Settlement day saw Nifty sold off from the highs of the day below 5640 and ultimately closed marginally lower at 5649.50 a small loss of 13.95 points but the series saw a huge gain of 6%. Nifty has started the series with huge OI of 2.18 Cr at an WAP of 5667. The Option Table at the start of the series is evenly distributed with best support at 5300 and good resistance at 5800 for the time being. 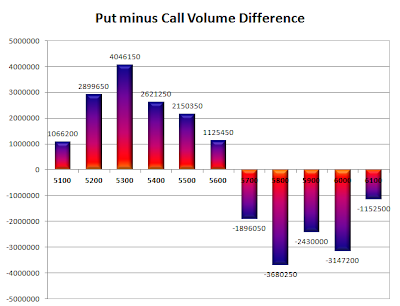 Call option 5300-6000 added 46.74 lacs huge amount of OI, with small addition seen at lower levels also. Put Option 6000-5100 added 66.29 lacs huge amount of OI. Highest accumulation on Call option 5700 at 44.9 lacs & 5800 at 43.9 lacs whereas Put option 5300 at 50.7 lac & 5500 at 37.4 lacs. Nifty Open Interest is at 2,18,28,400 up by 54,59,300 with small decrease in price, most probably huge short build-up. Bank Nifty Open Interest is at 12,65,725 up by 4,13,900 with not much change in price, most probably short/long build-up. FII’s bought huge 5.46 lacs of Futures, most probably long build-up, and their average price per contract comes to around 5614. FII’s future open contract as on date is 4.59 lacs. 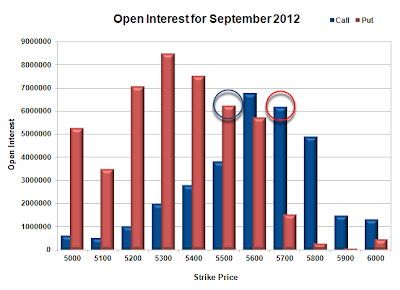 PCR Open Interest (Volume) at the start of the series is just above 1 at 1.088. 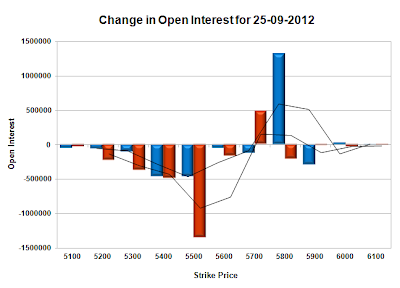 Support developing at 5500 with OI of 37.4 lacs and below that at 5300 with OI of above 50.7 lacs. Resistance at 5700 with huge addition for the day at 10.8 lacs and net OI above 44.9 lacs and above that at 5800 with huge OI of 43.9 lacs. 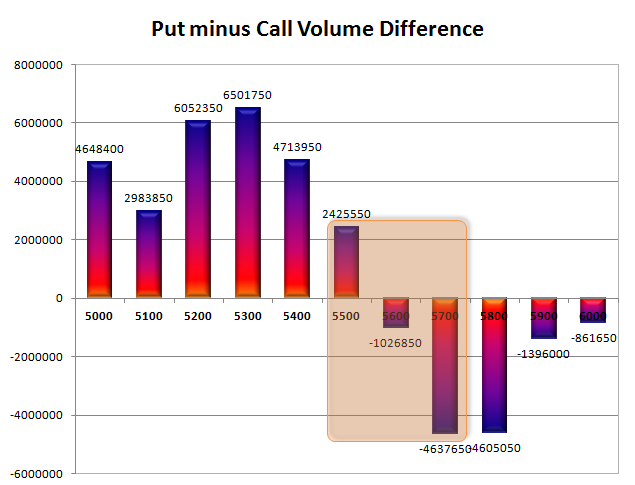 Range as per Option Table is 5612 -5704 and as per VIX is 5599 - 5700 with 5660 as the Pivot. Nifty opened in the negative around 5650 level on weak global cues, but immediately moved up towards the previous day’s close. Strong seller moved the index again back to the lows of the day but Nifty managed to close flat at 5663.45 a small loss of 10.45. The Option Table saw huge addition at 5700CE and 5600PE, which seems to be the range for Expiry. Call option 5600-5700 added 15.75 lacs huge amount of OI, with huge profit booking seen at 5800 and above strike prices. Put Option 5600 added 8.90 lacs huge amount of OI, with huge profit booking seen at 5600 and below strike prices. 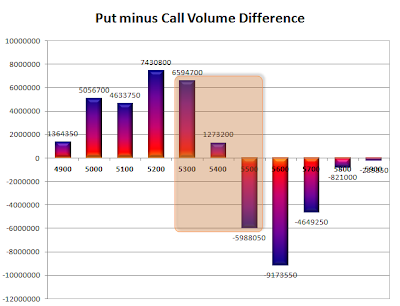 Highest accumulation on Call option 5800 at 86.3 lacs & 5700 at 83.3 lacs whereas Put option 5600 at 86.0 lac & 5500 at 73.0 lacs. Nifty Open Interest is at 1,56,29,350 down by 35,78,900 whereas Oct series added 55.78 lacs OI with small decrease in price, most probably 100% rollover with huge short build-up in next series. Bank Nifty Open Interest is at 14,61,300 down by 2,13,775 whereas Oct series added 3.04 lacs OI with not much change in price, most probably 100% rollover with short/long build-up in next series. FII’s bought huge 6.18 lacs of Futures, most probably long build-up as their net OI also increased by 35.60 lacs, and their average price per contract comes to around 5569. FII’s future open contract as on date is 7.71 lacs. PCR Open Interest (Volume) is steady at 1.642. 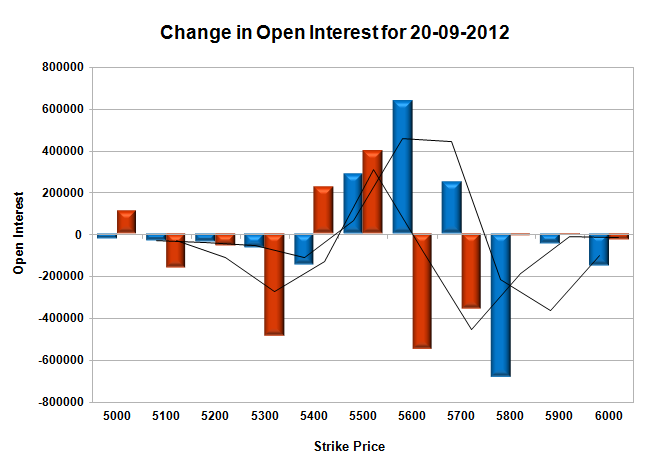 Support at 5600 has been strengthened with huge addition of 8.9 lacs for the day with net OI above 86 lacs. 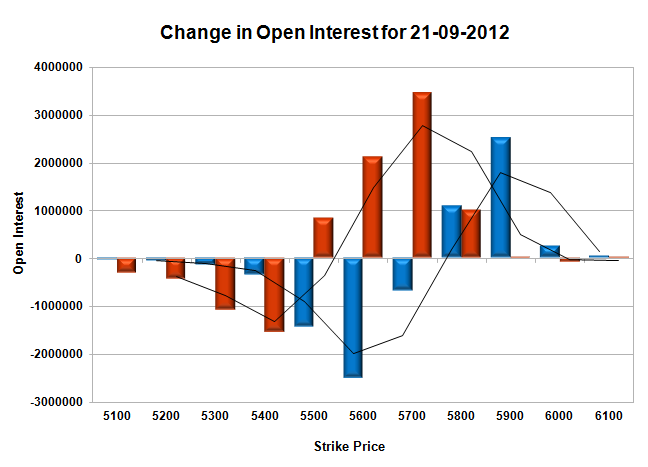 Resistance at 5700 with huge addition for the day at 14.4 lacs and net OI now at 83.3 lacs. 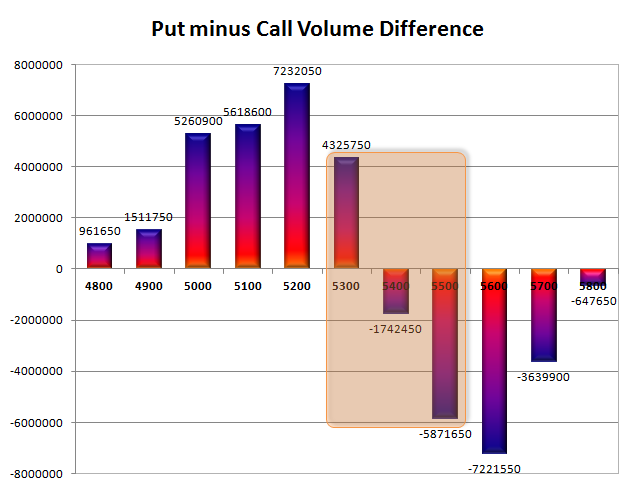 Range as per Option Table is 5614 -5706 and as per VIX is 5613 - 5714 with 5670 as the Pivot. Nifty opened flat and stayed in a narrow range for the better part of the day, keeping the previous days close as pivot. It ultimately closed very flat at 5673.90 a minute gain of 4.30 points and in the process made a perfect ‘Doji’ candlestick. 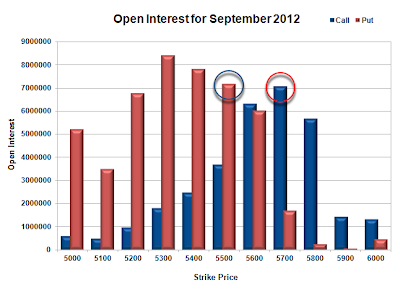 The Option Table saw addition only at 5800CE and 5700PE, whereas huge profit booking was seen at lower level PE’s. 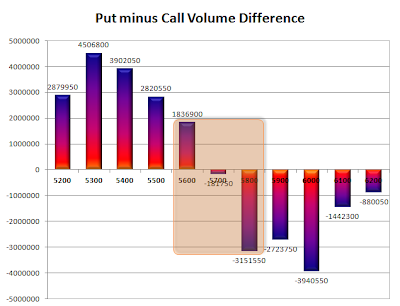 Call option 5800 added 13.2 lacs huge amount of OI, with huge liquidation seen at 5600 and below strike prices. Put Option 5700 added 4.85 lacs huge amount of OI, with huge profit booking seen at 5600 and below strike prices. Highest accumulation on Call option 5800 at 89.6 lacs & 5700 at 68.9 lacs whereas Put option 5600 at 77.1 lac & 5500 at 76.9 lacs. Nifty Open Interest is at 1,92,08,250 down by 23,36,750 whereas Oct series added 46.97 lacs OI with small increase in price, most probably 100% rollover with huge long build-up in next series. Bank Nifty Open Interest is at 16,75,075 down by 2,05,500 whereas Oct series added 1.20 lacs OI with small increase in price, most probably short covering with huge rollover in next series. FII’s bought huge 10.97 lacs of Futures, most probably long build-up as their net OI also increased by 48.45 lacs, and their average price per contract comes to around 5567. FII’s future open contract as on date is 7.00 lacs. PCR Open Interest (Volume) is decreasing steadily from the high of 1.714 and now at 1.612. 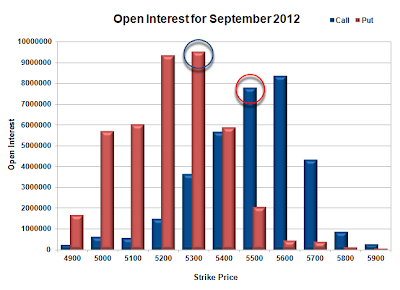 Strong Support still at 5600 though some OI got covered and below that at 5500 with huge OI of 76.94 lacs. 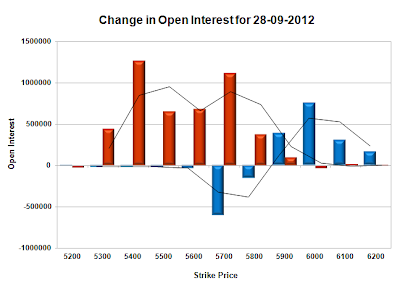 Resistance still very much at 5700 with OI above 68.9 lacs and above that at 5800 with highest OI of 89.6 lacs. 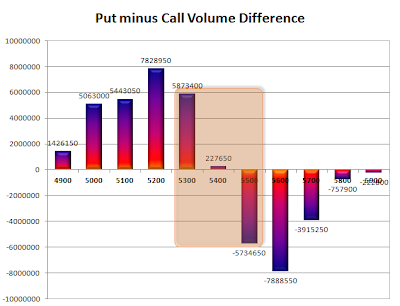 Range as per Option Table is 5629 -5723 and as per VIX is 5623 - 5725 with 5680 as the Pivot. Nifty opened flat and tried to move up above 5700 but was sold of immediately to the lows around 5670. It again tried to consolidate around the previous day’s close but during the afternoon session a weak opening in Europe saw the index closing at the low point at 5669.60, a small loss of 21.55 points. The Option Table saw huge addition at 5800CE and 5500PE which now has OI above 90 lacs. 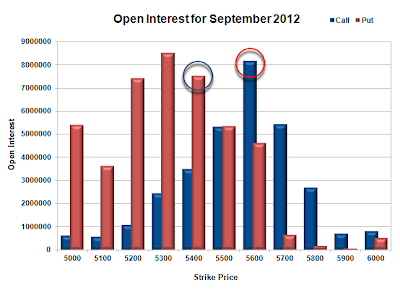 Call option 5700-6000 added 25.0 lacs huge amount of OI, with huge liquidation seen at 5600 and below strike prices. Put Option 5800, 5600-5500 added 12.8 lacs huge amount of OI, with huge profit booking seen at 5400 and below strike prices. Highest accumulation on Call option 5800 at 76.4 lacs & 5700 at 70.1 lacs whereas Put option 5500 at 90.5 lac & 5600 at 78.8 lacs. Nifty Open Interest is at 2,15,45,000 down by 6,01,800 whereas Oct series added 21.07 lacs OI with small decrease in price, most probably 100% rollover with huge short build-up in next series. Bank Nifty Open Interest is at 18,80,575 down by 85,725 whereas Oct series added 1.21 lacs OI with increase in price, most probably 100% rollover and huge long build-up in next series. FII’s sold huge 2.58 lacs of Futures, most probably short build-up as their net OI also increased by 37.12 lacs, and their average price per contract comes to around 5549. FII’s future open contract as on date is 6.03 lacs. PCR Open Interest (Volume) just cooled down a bit to 1.6666. 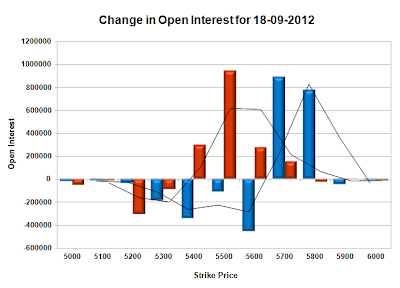 Strong Support at 5600 with total OI above 78.8 lacs and below that at 5500 with highest OI of 90.45 lacs. 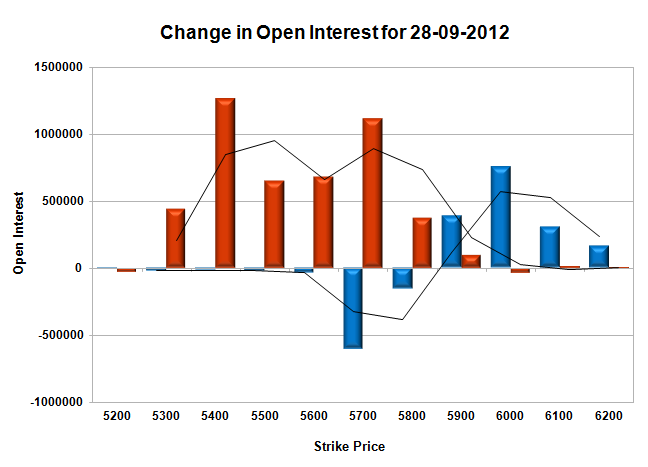 Resistance still at 5700 with OI above 70.1 lacs and above that at 5800 with OI of more than 76.4 lacs. 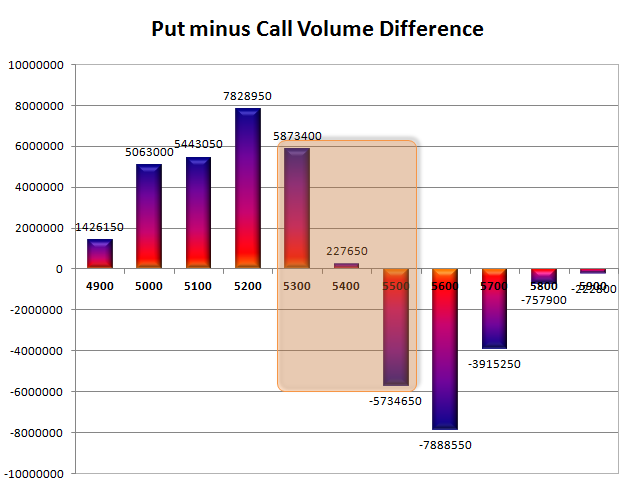 Range as per Option Table is 5631 -5726 and as per VIX is 5614 - 5725 with 5680 as the Pivot. Nifty after opening positive on good global cues had a one way ride to the highs of the day with huge buying. The index at one point of time was 165 points in positive but at the end of the day closed just below 5700 at 5691.15 still a huge gain of 136.90 points and on a week on week basis the index added 113.50 points or 2.03%. The Option Table saw huge addition at 5600 and 5700PE. Call option 5800-6000 added 38.63 lacs huge amount of OI, with huge liquidation seen at 5700 and below strike prices. Put Option 5800-5500 added 74.3 lacs huge amount of OI, with huge profit booking seen at 5400 and below strike prices. 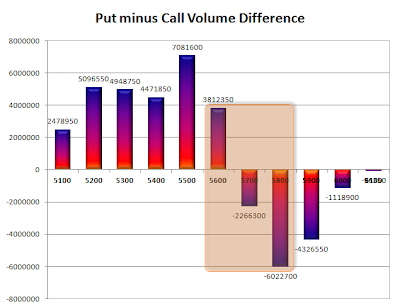 Highest accumulation on Call option 5700 at 66.4 lacs & 5800 at 60.8 lacs whereas Put option 5500 at 84.2 lac & 5600 at 75.8 lacs. Nifty Open Interest is at 2,21,46,800 up by 2,68,100 whereas Oct series added 14 lacs OI with increase in price, most probably huge long build-up in both series. Bank Nifty Open Interest is at 19,66,300 up by 21,100 whereas Oct series added 93.7 thousand with increase in price, most probably huge long build-up in both series. FII’s sold huge 4.30 lacs of Futures, most probably short build-up as their net OI also increased by 15.23 lacs, and their average price per contract comes to around 5557. FII’s future open contract as on date is 5.29 lacs. 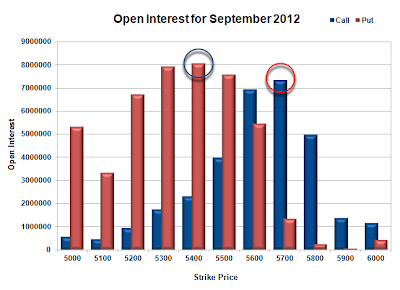 PCR Open Interest (Volume) moved to unprecedented level in this series at 1.714. 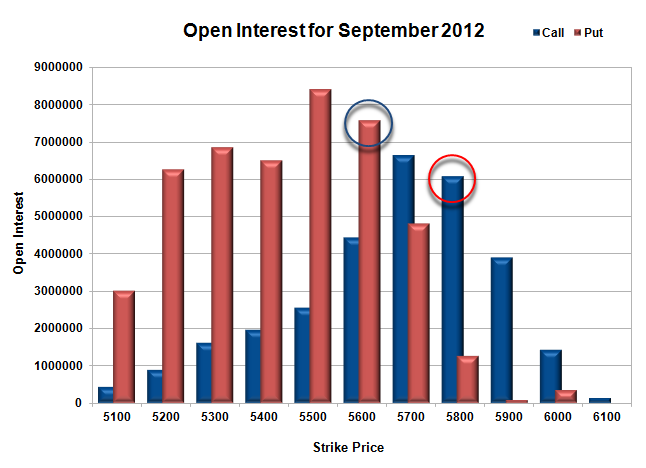 Strong Support at 5600 with total OI above 75.8 lacs and below that at 5500 with highest OI of 84.2 lacs. 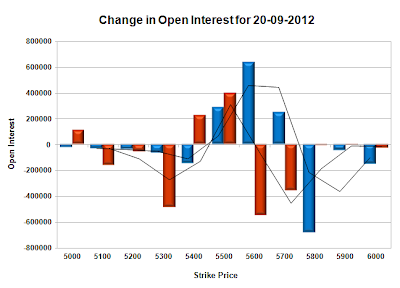 Resistance moved up one level higher at 5700 with OI at 66.4 lacs and above that at 5800 with OI of above 60.8 lacs. 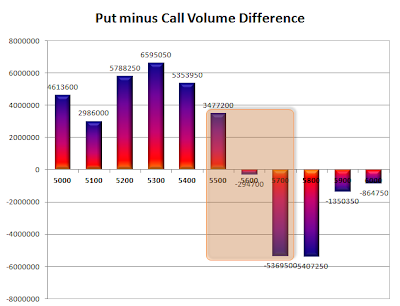 Range as per Option Table is 5619 -5718 and as per VIX is 5635 - 5748 with 5660 as the Pivot. Nifty had a very weak opening below 5550 and tried to move up, but was sold off to end at the lows of the day at 5554.25 a loss of 45.80 points and below the psychological level of 5600 unable to sustain above for more than 2 days. The drama going on in Indian Politics is helping the Bears cause. The Option Table saw huge addition at 5600CE. Call option 5500-5700 added 11.76 lacs huge amount of OI, with huge liquidation seen at 5400 and below strike prices. Put Option 5500-5400 added 6.25 lacs huge amount of OI, with huge liquidation seen at 5600 and below strike prices. Highest accumulation on Call option 5700 at 73.3 lacs & 5600 at 69.4 lacs whereas Put option 5400 at 80.5 lac & 5300 at 79.3 lacs. 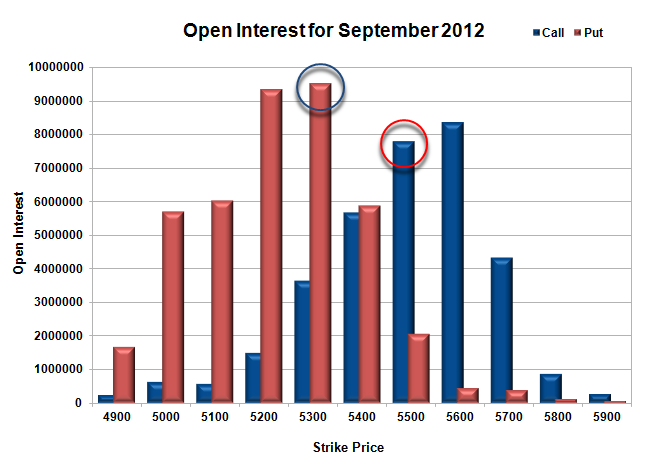 Nifty Open Interest is at 2,18,78,700 up by 2,40,300 with decrease in price, most probably huge short build-up. 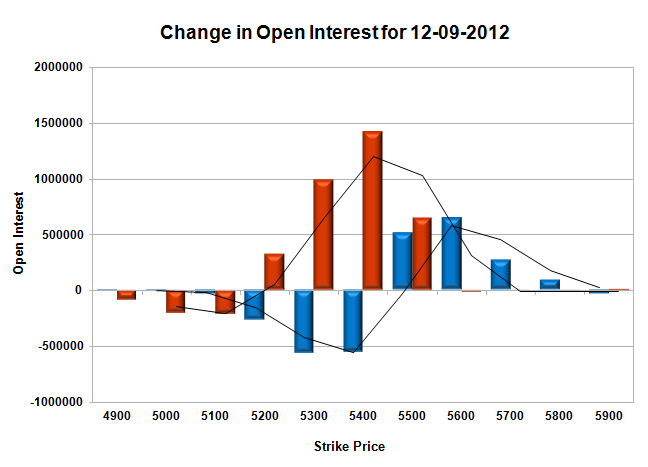 Bank Nifty Open Interest is at 19,45,200 down by 1,00,600 with decrease in price, most probably huge long liquidation. FII’s sold small 35.3 thousand Futures, most probably short build-up as their net OI also increased by 12.46 lacs, and their average price per contract comes to around 5487. FII’s future open contract as on date is 4.98 lacs. PCR Open Interest (Volume) took a breather today and came down at 1.521. 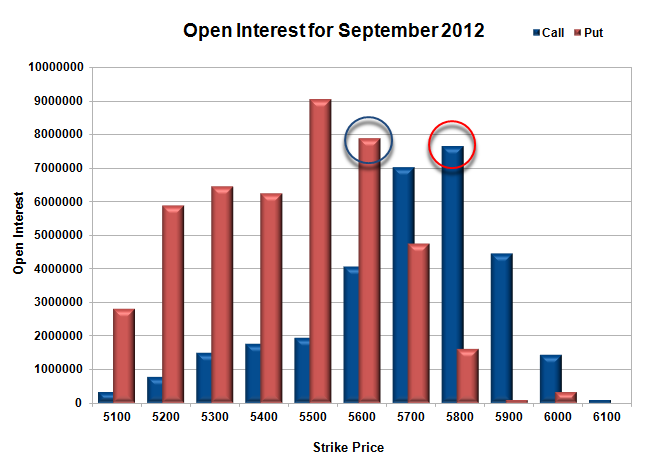 Strong Support at 5500 with total OI above 75.8 lacs and below that at 5400 with OI of 80.5 lacs. Resistance got upgraded to 5600 with huge addition of 6.36 lacs for the day, with OI at 69.4 lacs and above that at 5700 with OI of above 73.3 lacs. 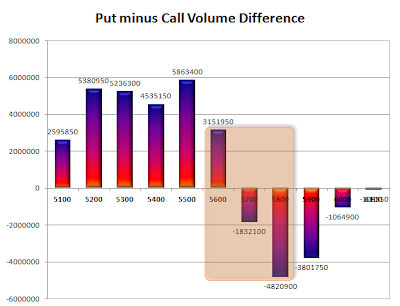 Range as per Option Table is 5509 -5601 and as per VIX is 5500 - 5608 with 5570 as the Pivot. Nifty had a nothing kinda day today, with the Bulls and the Bears neither party in mood to move the index. The index stayed in a narrow range of 20 points for the better part of the day and closed in red after 9 straight session of positive close at 5600.05, a small loss of 9.95 points. The Option Table saw huge addition at 5500PE and 5700CE. 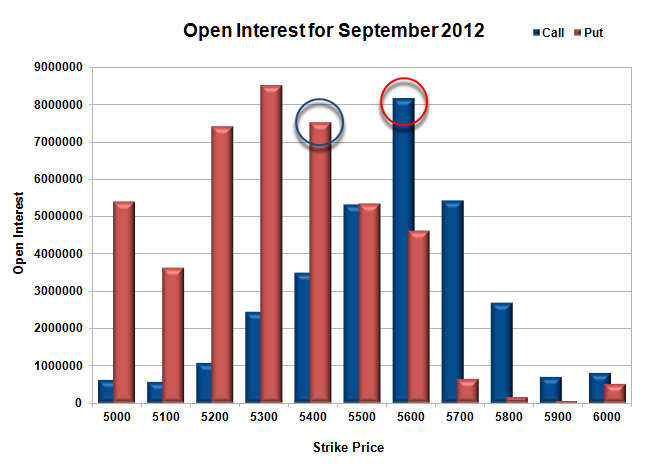 Call option 5700-5800 added 16.6 lacs huge amount of OI, with huge liquidation seen at 5600 and below strike prices. Put Option 5700-5400 added 16.7 lacs huge amount of OI, with profit booking seen at 5300 and below strike prices. Highest accumulation on Call option 5700 at 70.8 lacs & 5600 at 63.1 lacs whereas Put option 5300 at 84.1 lac & 5400 at 78.3 lacs. 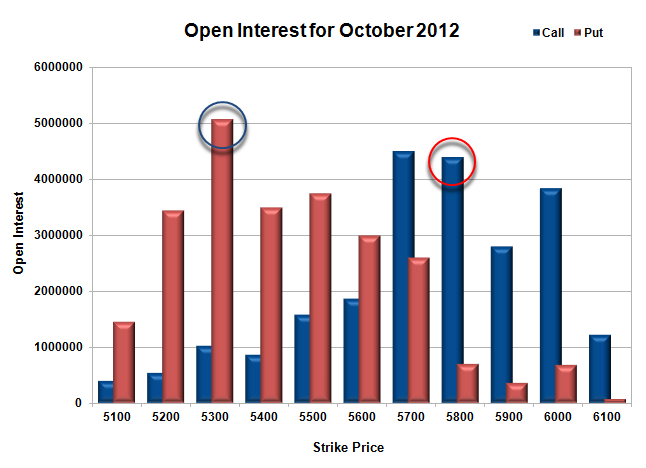 Nifty Open Interest is at 2,16,38,400 up by 4,34,000 with no change in price, most probably huge long/short build-up. Bank Nifty Open Interest is at 20,45,800 up by 30,875 with increase in price, most probably huge long build-up. FII’s bought huge 2.28 lacs Futures, most probably long build-up as their net OI also increased by 11.61 lacs, and their average price per contract comes to around 5543. FII’s future open contract as on date is 4.733 lacs. 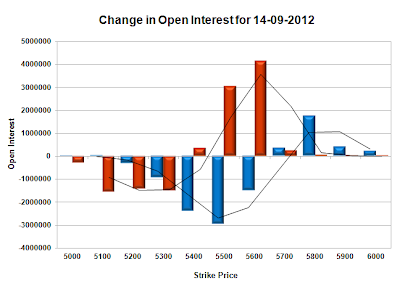 PCR Open Interest (Volume) made another high today and now at 1.544. Support at 5500 is getting better by the day, with huge addition at 9.4 lacs and total OI above 71.8 lacs and below that at 5400 with OI of 84.1 lacs. The best Resistance as per Option Table right now is at 5700 with OI of above 70.8 lacs. Range as per Option Table is 5555 -5648 and as per VIX is 5548 - 5652 with 5590 as the Pivot. Another gap-up saw Nifty open around 5640, but profit booking at the highs saw the index nosedive below 5600 level to 5585. The RBI governor tried to infuse some positivity with 25bps CRR cut which saw the index again above 5600. The day closed at 5610.00 a small gain of 32.35 points, the highest close in 14 months. The Option Table saw huge addition by the PE writers at 5700-5500 and the CE writers were not far behind adding 29.8 lacs at 5700-5800 level. 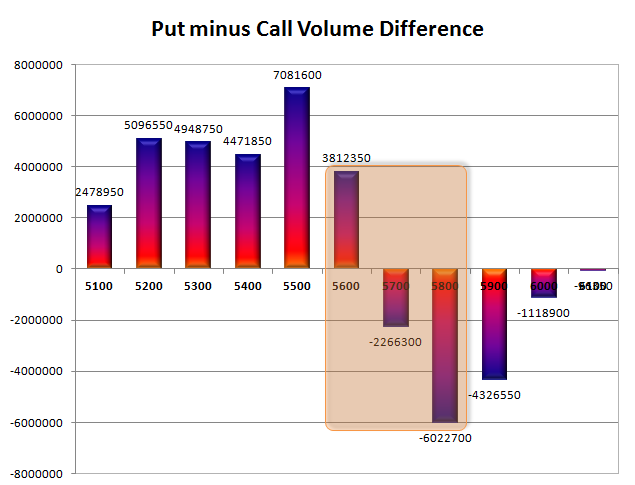 Call option 5700-6000 added 42.4 lacs huge amount of OI, with huge liquidation seen at 5600 and below strike prices. Put Option 5800-5500 added 30.0 lacs huge amount of OI, with profit booking seen at 5200 and below strike prices. 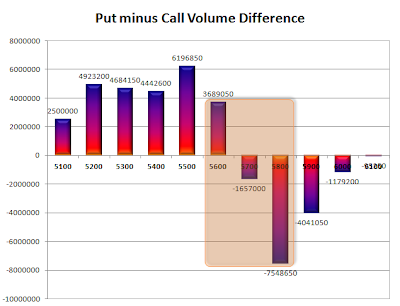 Highest accumulation on Call option 5600 at 67.6 lacs & 5700 at 61.9 lacs whereas Put option 5300 at 85 lac & 5400 at 75.3 lacs. Nifty Open Interest is at 2,12,04,400 up by 10,49,950 (another addition of 10 lacs+) with increase in price, most probably huge long build-up. Bank Nifty Open Interest is at 20,14,925 up by 2,74,850 with increase in price, most probably huge long build-up. FII’s bought huge 20.77 lacs Futures in addition to 19.67 lacs bought on Friday, most probably long build-up as their net OI also increased by 10.71 lacs, and their average price per contract comes to around 5547. FII’s future open contract as on date is 4.55 lacs. PCR Open Interest (Volume) has increased to highs of the series at 1.526 due to huge liquidation at 5600-5500CE Levels. Initial support at 5500 with huge addition for the day at 8.99 lacs for the day and below that at 5400 with OI of 75.3 lacs. 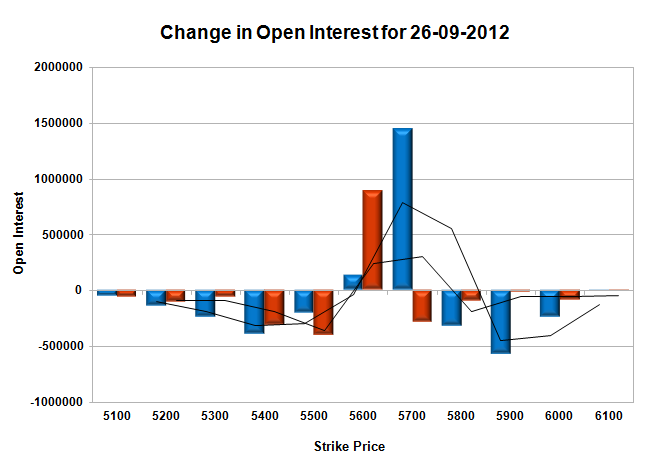 Resistance as per Option Table right now is at 5700 with OI of just above 61.9 lacs. 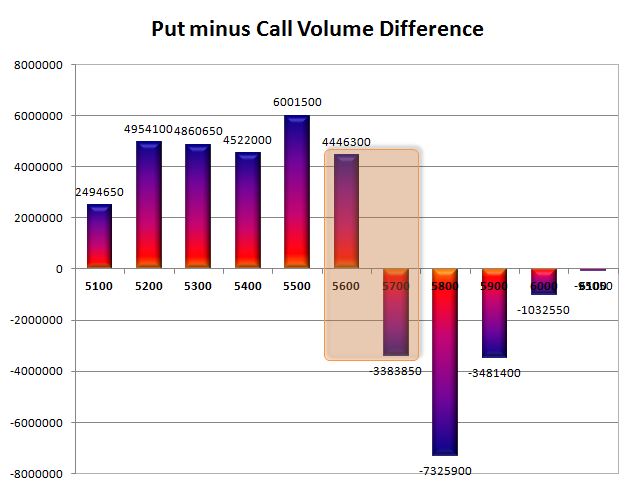 Range as per Option Table is 5567 -5660 and as per VIX is 5558 - 5662 with 5590 as the Pivot. Nifty opened huge gap-up above 5500 buoyed by the US Fed move to infuse liquidity in the form of bond purchase to the tune of S40 billion per month. The index surged 142.30 points, the highest single day gain this year to end at 5577.65 though Inflation came in at 7.55%, higher than expected. The Option Table saw huge addition by the PE writers to the tune of 74 lacs at 5700-5500 level and huge liquidation was seen at 5600-5400CE. Call option 5700-6000 added 27.0 lacs huge amount of OI, with huge liquidation seen at 5600 and below strike prices. Put Option 5700-5400 added 77.52 lacs huge amount of OI, with profit booking seen at 5300 and below strike prices. Highest accumulation on Call option 5600 at 81.6 lacs & 5700 at 54.2 lacs whereas Put option 5300 at 85.1 & 5400 at 75.3 lacs. Nifty Open Interest is at 2,01,54,450 up by 14,58,700 (highest single day addition in this series) with increase in price, most probably huge long build-up. 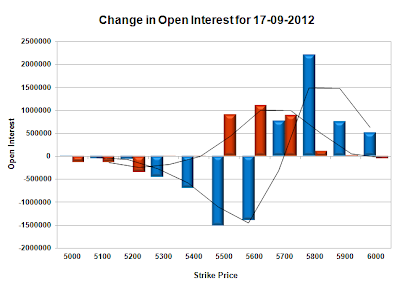 Bank Nifty Open Interest is at 17,40,075 up by 19,025 with increase in price, most probably huge long build-up. FII’s bought huge 19.67 lacs Futures, most probably long build-up as their net OI also increased by 15.03 lacs, and their average price per contract comes to around 5497. FII’s future open contract as on date is 4.34 lacs. 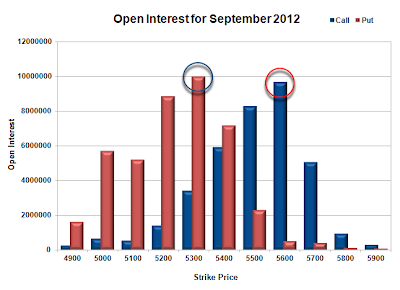 PCR Open Interest (Volume) jumped up to 1.466 due to huge addition at 5600 & 5500PE and short covering at 5400 and 5500CE. Initial support has moved up to 5500 with huge addition for the day at 30.37 lacs for the day and below that at 5400 with OI of 75.3 lacs. Resistance are falling by the wayside every day, though 5600 covered huge OI but still looks like initial resistance and above that at 5700 with OI of just above 54.2 lacs. Range as per Option Table is 5519 -5613 and as per VIX is 5533 - 5623 with 5560 as the Pivot. Nifty opened flat and stayed in a narrow range of 25 points for the entire session to close flat at 5435.35 a negligible gain of 4.35 points and a DOJI candle for the day. It seems like market is waiting for the big event lined up in the US. The Option Table saw huge addition at 5400PE and 5600CE, with 5300PE now at 1 crore for the series. Call option 5400-5800 added 28.73 lacs huge amount of OI, with huge liquidation seen at 5300 and below strike prices. Put Option 5500-5300 added 20.22 lacs huge amount of OI, with profit booking seen at 5200 and below strike prices. Highest accumulation on Call option 5600 at 96.7 lacs & 5500 at 82.9 lacs whereas Put option 5300 at 1 crore & 5200 at 88.4 lacs. 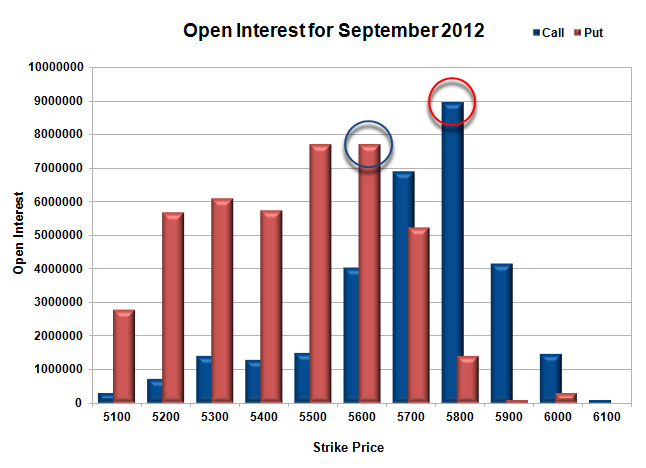 Nifty Open Interest is at 1,86,95,750 up by 2,64,000 with increase in price, most probably huge long build-up. Bank Nifty Open Interest is at 17,21,050 up by 27,600 with increase in price, most probably huge long build-up. FII’s bought 1.98 lacs Futures, most probably long build-up as their net OI also increased by 4.89 lacs, and their average price per contract comes to around 5281. FII’s future open contract as on date is 4.04 lacs. PCR Open Interest (Volume) dipped a bit to 1.191 due to huge profit booking seen at 5200-5100PE. Initial support has moved up to 5400 with huge addition of 12.94 lacs for the day and below that at 5300 with highest OI of 1 crore in the option table. 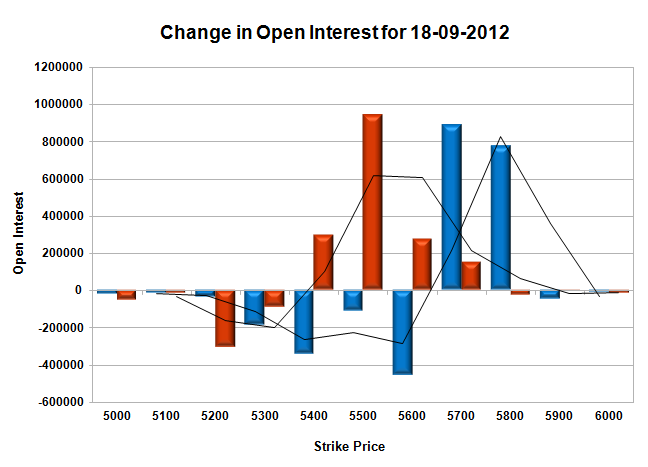 Resistance at 5500 with huge OI of 82.9 lacs and above that at 5600 with OI above 96.7 lacs. Range as per Option Table is 5383 -5479 and as per VIX is 5391 - 5480 with 5430 as the Pivot. Nifty opened strong above the psychological level of 5400 and stayed in a very narrow range of 15 points for the better part of the first half with not much change though IIP data which came out today was worse than expected at 0.1% against an expectation of 0.5% MoM basis. Nifty during the afternoon moved up on positive news from German court on ESM to end the day at 5431.00 a smart gain of 41.00 points. It was the highest close for Nifty in the last 6 months. 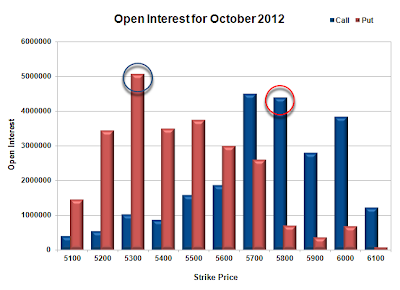 Coming back to Option Table, it was a day when the 5400PE writers nudged above the 5400CE open interest. 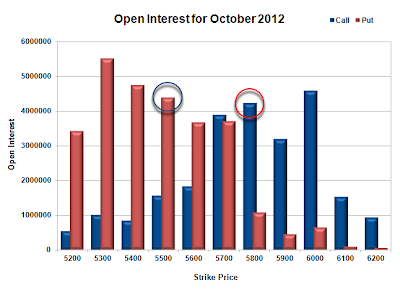 Call option 5500-5800 added 15.25 lacs huge amount of OI, with huge liquidation seen at 5400 and below strike prices. Put Option 5500-5200 added 33.77 lacs huge amount of OI, with profit booking seen at 5100 and below strike prices. Highest accumulation on Call option 5600 at 83.5 lacs & 5500 at 78.1 lacs whereas Put option 5300 at 95.1 lacs & 5200 at 93.5 lacs. Nifty Open Interest is at 1,84,31,750 up by 5,50,900 with increase in price, most probably huge long build-up. 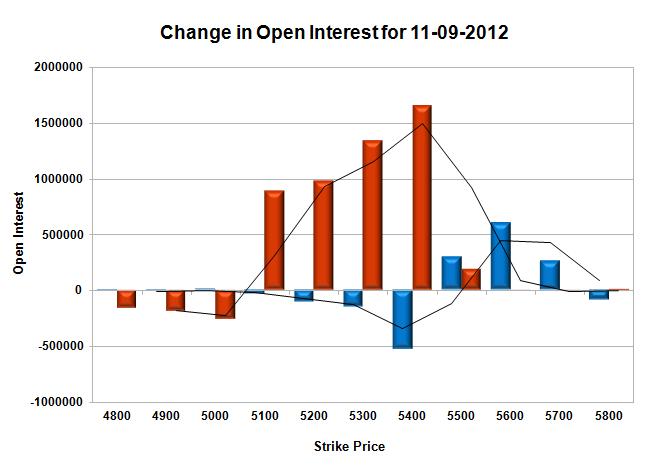 Bank Nifty Open Interest is at 16,93,450 down by 3,175 with increase in price, most probably small short covering. FII’s bought 9.12 lacs Futures, most probably long build-up as their net OI also increased by 6.56 lacs, and their average price per contract comes to around 5266. FII’s future open contract as on date is 3.94 lacs. PCR Open Interest (Volume) is moving up fast and now at 1.257. 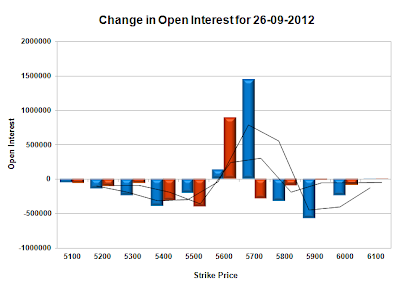 Super Support at 5300 with highest OI of 95.12 lacs and below that at 5200 with OI above 93.5 lacs. Resistance has shifted one level above at 5500 with huge OI of 78.1 lacs and above that at 5600 with OI above 835 lacs. 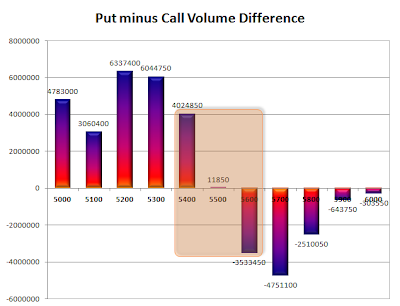 Range as per Option Table is 5370 -5467 and as per VIX is 5388 - 5474 with 5420 as the Pivot. Nifty opened weak below 5350 level, but the buyers took control from the word go and pushed the index into positive territory to close at the highest point of the day at 5390.00 a good gain of 26.55 points. Whatever small chance Bears had was nipped in the bud with huge addition at 5200-5400PE Levels. Call option 5500-5700 added 11.59 lacs huge amount of OI, with huge liquidation seen at 5400 and below strike prices. Put Option 5500-5100 added 50.45 lacs huge amount of OI, with profit booking seen at 5000 and below strike prices. Highest accumulation on Call option 5600 at 77 lacs & 5500 at 72.9 lacs whereas Put option 5200 at 90.2 lacs & 5300 at 85.2 lacs. 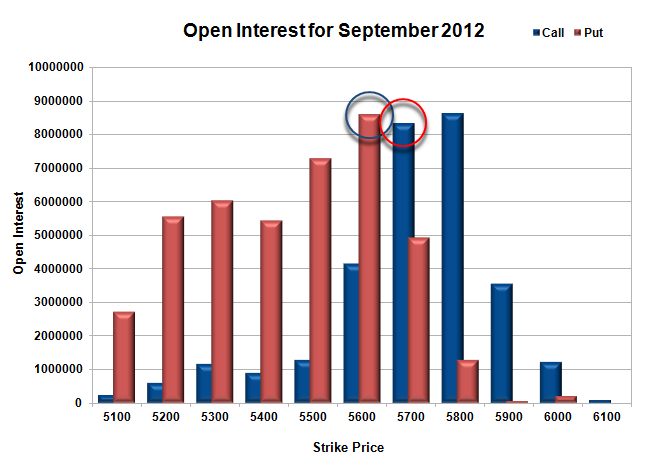 Nifty Open Interest is at 1,78,80,850 up by 8,62,550 with increase in price, most probably huge long build-up. Bank Nifty Open Interest is at 16,96,625 down by 33,825 with increase in price, most probably short covering. FII’s bought 2.69 lacs Futures, most probably long build-up as their net OI also increased by 10.26 lacs, and their average price per contract comes to around 5197. FII’s future open contract as on date is 3.81 lacs. PCR Open Interest (Volume) has jumped up at 1.179 with huge addition at 5200-5400PE Level. Support at 5300 got better with huge addition of 13.4 lacs and now OI is above 85.2 lacs and below that at 5200 with highest OI of 90.2 lacs. Resistance though weakening but still at 5400 with OI of 62.2 lacs and above that at 5500-5600 with OI above 73 lacs in each. Range as per Option Table is 5331 -5420 and as per VIX is 5347 - 5433 with 5370 as the Pivot.